The single-seat concept race car looks like the world's craziest Batmobile, just as we expected. 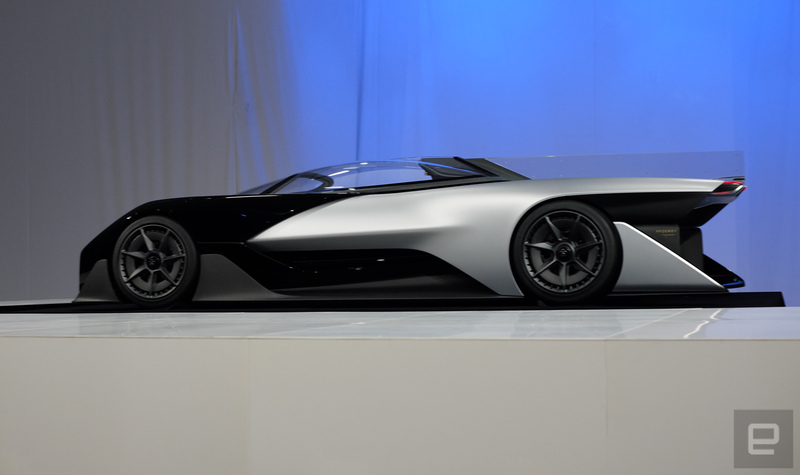 Faraday Future has unveiled the FFZero1, a concept car that the firm promises will spearhead a complete revolution in the way we drive. "What would happen if we just started clean?" the company's flashy promotional video asked the assembled audience here at CES 2016. The Zero1 is a single-seat race car that, it's likely, will quickly become an object of desire for car fans worldwide. As for its looks, you won't be surprised to see that the craft is pretty much what we saw in the leaked renders from earlier in the day. As well as the single seat, the fact that the Zero1 is a concept car has enabled its designer, Richard Kim, to let his imagination run wild. For instance, the vehicle has an all-white interior that you'd never find on a production whip. In addition, the engineer consulted with NASA to learn that the seating position should be 45 degrees, apparently the perfect angle for driver comfort. The steering wheel has a smartphone built into the center, and the headrest has a port baked into the back that pumps air and water into the driver's crash helmet. You'll spot a jutting line that runs along the contours of the car—it's called the "UFO Line" and will become a defining feature of all of Faraday Future's futur ... forthcoming rides. 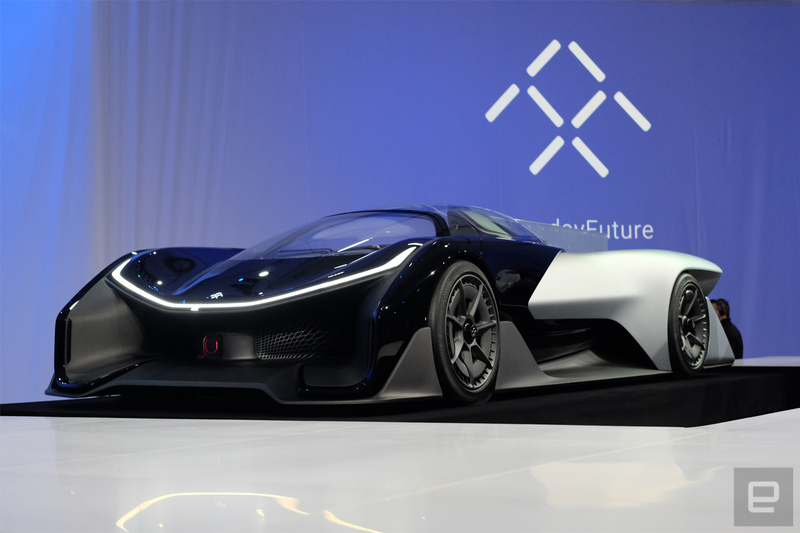 Ambition has been a watchword in the corporate communications from Faraday Future—FF, as it prefers to be called. The firm has pledged to spend $1 billion to build a production facility in Nevada and promises that it'll break ground on the building within the next few weeks. The firm credits the speed of the build to its close ties with Governor Brian Sandoval and North Las Vegas City mayor John Jay Lee. One of FF's unique selling points is that it's building its vehicles with Variable Platform Architecture, or VPA. Most current cars, you see, are normally built around a single platform that's sometimes shared among various companies to keep costs down. For instance, the Toyota Aygo, Peugeot 107 and Citroën C1 were all built using the same platform in a joint venture. By creating a modular architecture where strings of batteries run along the floor of the car, it's possible to expand or contract the wheelbase on a whim. In addition, the platform can support various motor configurations, offering between one and four depending on the model. Another thing FF is promising is that its cars will be packed so full of sensors and internet connectivity that it'll be capable of autonomous operation. In fact, the event described "varying levels of autonomy," which we take to mean that the firm intends to push out updates to its systems, much like Tesla. We should add at this point, however, that it's very easy to promise the world at such an early stage. There have been plenty of questions as to what company has been bankrolling Faraday's efforts, and now the firm has come clean. LeTV, a company that TechCrunch has described as the "Netflix of China," has revealed that it is the project's parent company. Its co-founder, Ding Lei, took to the stage to confirm his role in the affair, although we had a pretty strong indication of that before the show began. Confirming a Fortune report from last year, we spotted seat reservations for Grace Wang, LeTV's head of marketing, and Gao Jingshen, vice president of LeTV's "super car" project. The company has assembled a team of high-profile names, including R&D chief Nick Samson—who has previously developed vehicles for Tesla, Lotus and Jaguar. In addition, the firm's new head of marketing, Stacy Morris, most recently spent five years at BMW. Samson mentioned that FF has been going for only 18 months, and its development has been at an extraordinary pace. He believes that the firm will be able to produce its first production-ready model in "just a couple of years." We can't wait.